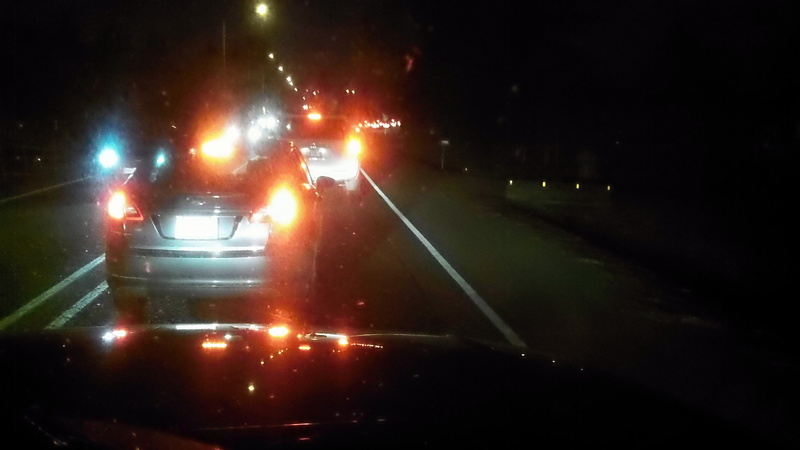 Tonight’s question: Why do innocent travelers have to pay the price — getting stuck in a massive Corvallis traffic jam — just because a football game has just ended? I can see why Beaver fans might put up with traffic paralysis after a game. After all, they volunteered their time. They wanted to be there. And if they have to sit in a long column of vehicles not going anywhere, they can pass the time by reliving the experience by thinking and talking about the game. I can see, though, that this would be more fun if the team had won. But even contemplating another loss, debating the merits of this or that play, or this or that player, or the coach, should make for a lively diversion while they’re sitting there staring at nothing but brake lights ahead. If, on the other hand, you’re just on your way home from the coast, say, and have to go through Corvallis because the highway builders have neglected to build a reasonable bypass, well, if that happens to you on a Saturday night in November, you are likely to end up on the disgruntled side. You may wonder why a university with big football ambitions hasn’t built a giant parking lot for 20,000 cars out in the country so that it could require fans to park there and then bus them to the stadium and back. I can’t disagree with anything in your post today. Well said Mr. Hering, well said. We are OSU. Resistance is futile. Prepare to be assimilated or crushed at our disgression which we seldom show. You can not change it. As long as you have all the staff voting and an extra 20,000 students voting you will never be able to bring the real world to Corvallis, when you have 20,000 people who have never had to be responsible for themselves also vote in one place, the people who have to pay for the streets and transit are stuck. Fix it???? how about treat students like folks in the Military, you vote at your home of record. That way, you remain a resident of where you lived and the electorate is more balanced in each area, both in Corvallis and at your home too. Don’t sweat the small stuff Hasso. The “problems” to which describe – have been going on for well over a generation. Knowing the issues of traffic, etc., at home games…might make for a realistic excuse to simply stay at the beach for another night. It could definitely lower the stress levels. Getting from Philomath to Albany through Corvallis isn’t all that hard even during the traffic that accompanies a Beaver home game. All you need to do is plan for it and use the back roads (Reservoir Road/Walnut Blvd/Hwy 20). I do it all the time. The difficulty comes when you need to get someplace that can only be accessed by the main routes that most people use. No, the game day traffic and taking an hour just to get through the traffic started in earnest about 10 years ago with the expansion of Reeser stadium. A generation ago when I went to Beaver football games I could barely find enough people in the parking lot to help me finish a pony keg. The drive home was no issue. The city of Corvallis could have helped reduce the problem substantially if they had allowed the addition of slip lanes as proposed by ODOT and Linn County coming onto hwy 34 from the bypass. Instead, they choose to let 13 guys in Lycra on bicycles hijack the process. The scaled down project could be completed for next football season but it will only improve the situation about 1/3 of what it otherwise would have done.